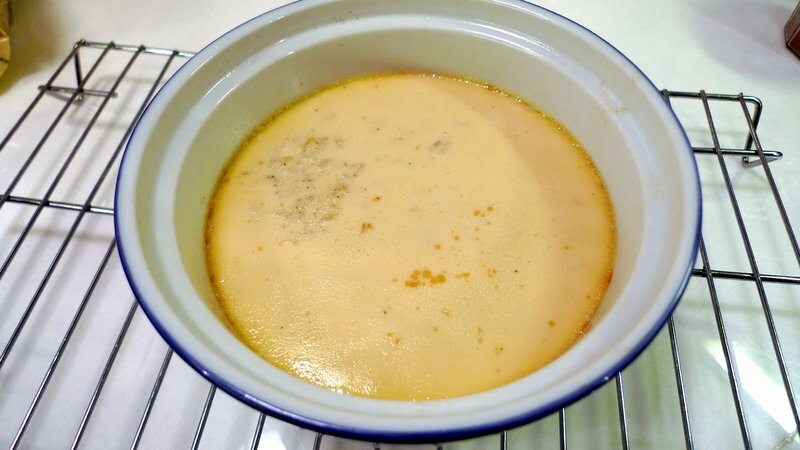 One recipe that caught my eye a week or so ago while browsing the New York Times’s website was Caramel Rice Flan. This egg-enhanced rice pudding is made with risotto rice, giving it a nicer “toothy” feel when you eat it. 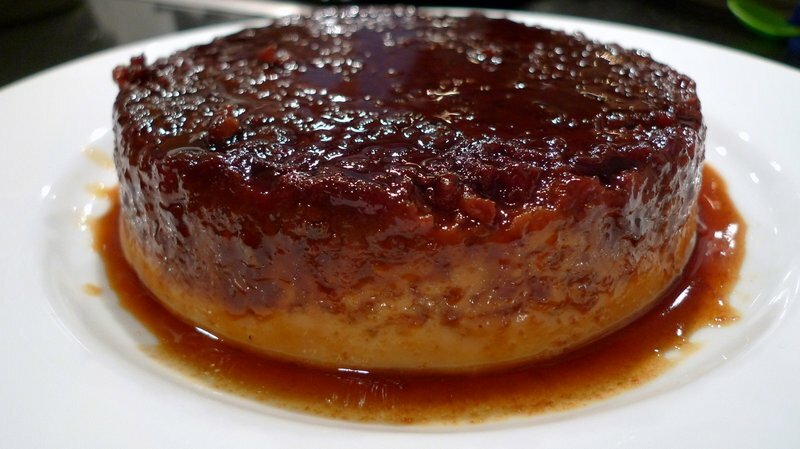 The best part is the homemade caramel which lines the bottom of the souffle dish, subsequently becoming the sauce for the flan when it is flipped upside down and unmolded onto a serving dish. I decided to try the recipe for dinner last Friday at Ko and Per’s place, where Tawn and his girlfriends gathered to watch the royal wedding. The recipe takes about an hour of active time to prepare and then around two hours to bake. After that, it needs at least six hours in the refrigerator so it really is a “make today for tomorrow” sort of dessert. 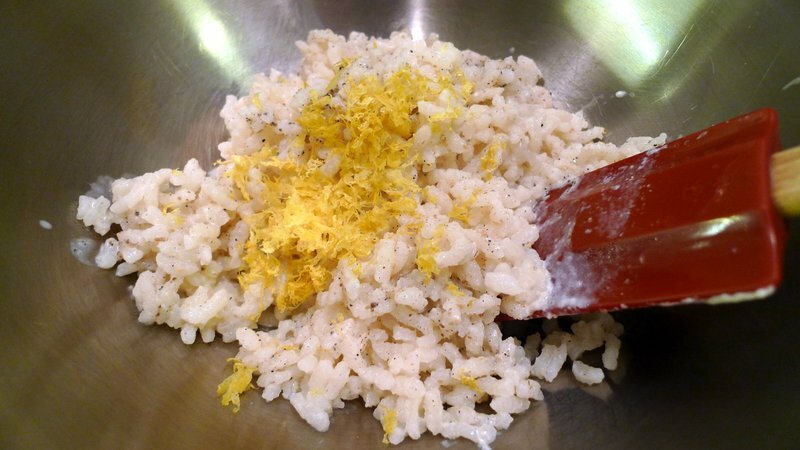 Ingredients include arborio rice (one of the types you use for risotto), milk, cinnamon sticks, ground cardamom, lemon zest, cardamom pods, cream, eggs, egg yolks, salt, and sugar. The recipe said it serves 8-10 but looking at it, it appeared to be a big recipe so I cut it in half. The recipe is moderately complex, requiring several saucepans, a few bowls, and a strainer. Helpful to have everything prepared in advance and maybe even an extra pair of hands along the way. 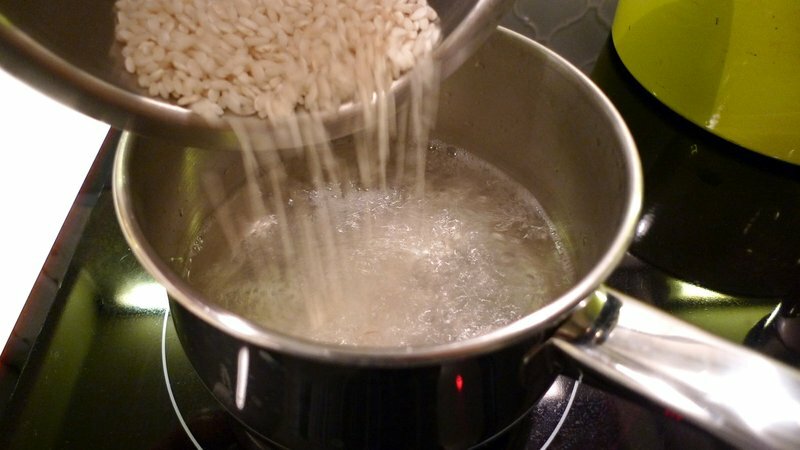 The first step is to simmer the rice in boiling water for about 15 minutes to start cooking it. 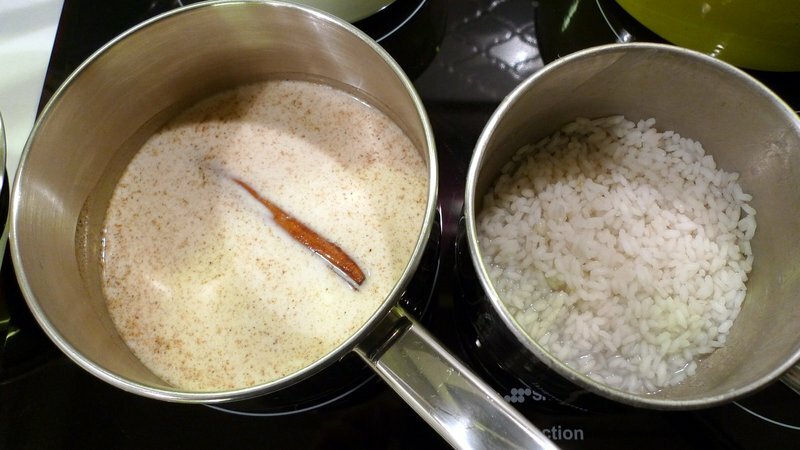 You then drain the rice, then add it to a medium saucepan with most of the milk, the cinnamon, and ground cardamom, bringing it to a boil and then lowering the temperature and simmering it for 30 minutes, cooking until the rice is very tender. Any unabsorbed milk is poured off and then the rice is put in the bowl and lemon jest is stirred in. 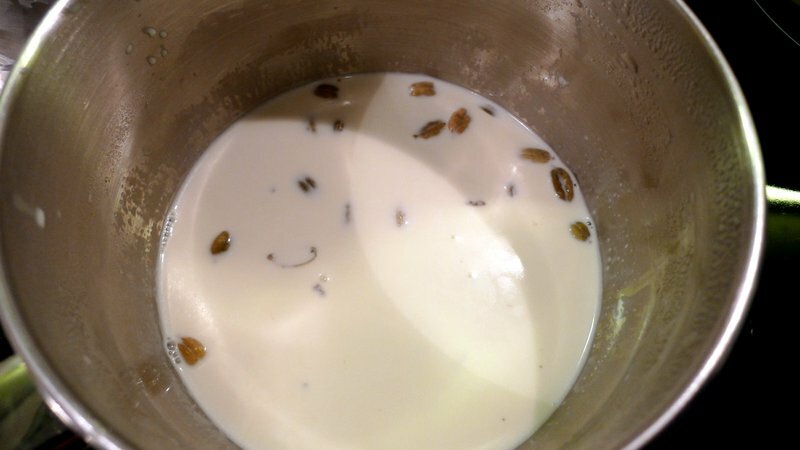 You then make the custard, cooking the rest of the milk, the cream, and the cardamom pods. While that is coming to a simmer, in a separate bowl you whisk together the eggs, egg yolks, and part of the sugar. 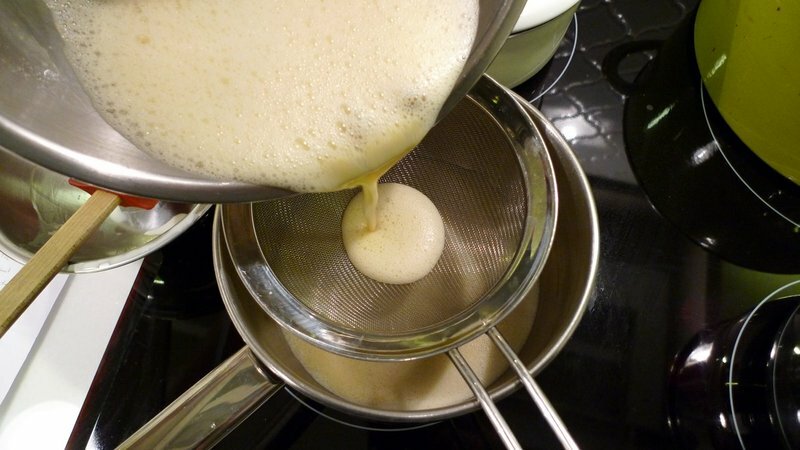 When the milk comes to a simmer, you temper the eggs by adding the milk and cream mixture to it a little at a time, whisking constantly. This keeps the eggs from scrambling. You then strain the mixture back into the pan, discarding the cardamom and any bits of egg that scrambled. Next, stir in the rice. This was the point where I felt like too many things were going on at one time and the recipe would be easier if a second set of hands was helping. That way elements of the dish could come together simultaneously. 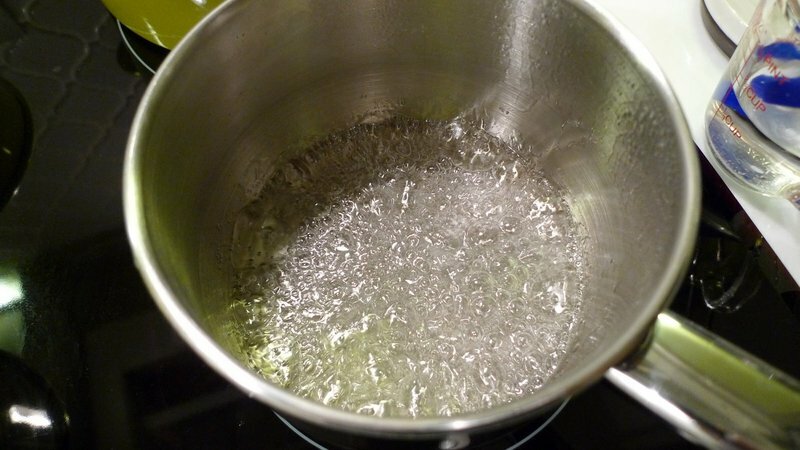 The next step was to make the caramel, heating the remaining sugar and a little water in a saucepan until it boils and starts to caramelize. I think I had the heat too high because it burned a bit, leaving the caramel with a slightly bitter taste. Must remember to be gentle when making caramel, something I have little experience doing. The caramel is poured into the buttered souffle dish and quickly swirled around the sides before it starts to cool. This was easier said than done! Then, pour the rice and custard mixture on top. The souffle dish is placed in the middle of a baking pan and boiling water is filled about halfway up the side of the pan. This water bath helps the custard cook more evenly, instead of the outsides cooking too fast and the inside still being uncooked. 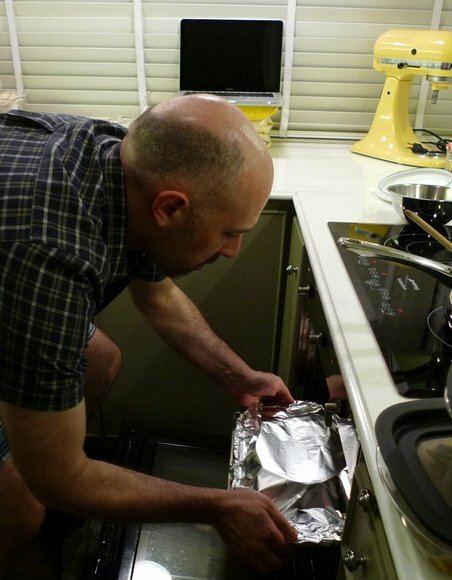 Cover the pan with foil, making some small slits in the corners of the foil for steam to escape. Pop it into a 300-degree oven for about 2 hours, checking after 90 minutes. Try to use a better bending technique than I did as I was just begging for a strained back. Since I had a half recipe I failed to anticipate that the cooking time would be less. When I checked at about 1 hour, 40 minutes the flan was a bit more solid than desired. Remove and allow to cool. At this point when I shook the dish it didn’t jiggle very much. The idea would be just a little jiggling in the center when it comes out of the oven, as it will continue to cook for several more minutes. Once cool, cover the flan with plastic wrap and chill in the refrigerator for at least 6 hours. The real moment of truth was how well it would unmold. You set the souffle dish in a larger pot with hot water in it for about 20 minutes, letting the caramel melt again and then loosening the edges of the flan. Invert it onto a serving dish. Expecting a potential disaster (after all, the recipe warns of this possibility), I decided to film it for posterity. Quite pleasant to look at, actually. Not quite as beautiful as the picture illustrating the Times’ article, but they probably had a better set-up for photography. The texture was like a pretty thick rice pudding, a little eggy but not overly so. The caramel was burned, there was no getting around the bitter flavor. I attribute it to making a half-recipe, which is so little that in even my smallest saucepan, overheating was a risk. Next time, maybe I’ll add a dollop of butter at the end to tame it a bit. All in all, though, it was a nice dessert. I’m going to try it again soon at the full recipe and see how it turns out. 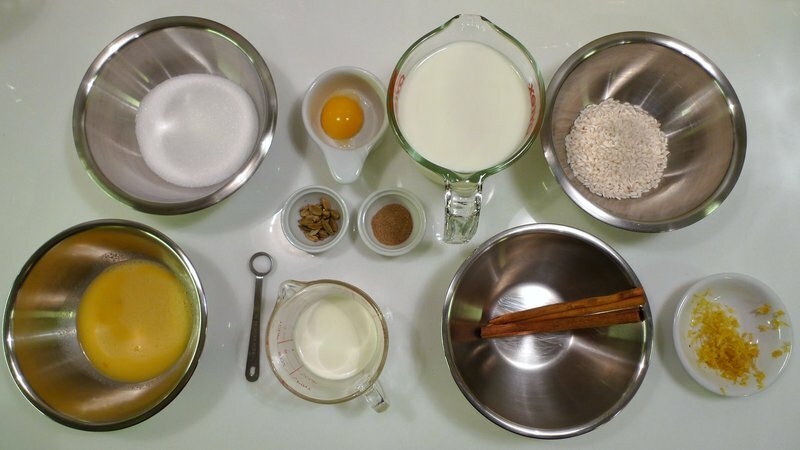 This entry was posted in Uncategorized and tagged Arborio, Caramel, cooking, dessert, Flan, food, New York, NYTimes, Pudding, Recipe, rice, Times, Website by christao408. Bookmark the permalink. Looks fantastic! I want to make it! I love anything with caramel on it! It looks delicious, Chris — keep practicing that caramel! Looks good but the taste is what is important. You have more patients than I as I would never be able to follow all those steps. The ‘flipping’ procedure in the video looks quite good! I bet it tastes very delicious as well. Did you serve it with ice-cream, or fresh cream? I salute you! Oh to be young and have the energy and the hungry desire to try out new recipes, even if that meant standing for hours at end. I don’t think I could have your patience Chris! Loved the video and the demonstration of the flipping. You know while watching it, the video doesn’t play continually, and every two or three secs, it gets a hiccup where nothing happens. So, when you were just about to flip the flan on to the dish, and had it inverted, the video stuck again, and I gasped…”Oh No! it’s going to go all over the floor.” but then the video came on again and you were able to tilt it completely. ha ha. But that looked really good Chris. @ZSA_MD – Hi Dr. Z – I know from experience that you have a lot of patience in the kitchen, so no excuses! =D As for the video, I think the problem may have been your internet connection, as it seems to be playing without interruption for me. Sorry that it didn’t play smoothly. @npr32486 – Oh, my kitchen is pretty meager, too. The video is from a friend’s kitchen, which is about four times the size of mine! @CurryPuffy – As with any Thai get-together, we ended up with four different desserts so I didn’t need to supplement this flan with anyting else. Plus, it has a lot of eggs and dairy so doesn’t really need ice cream or whipped cream to go with it. The caramel sauces it nicely. 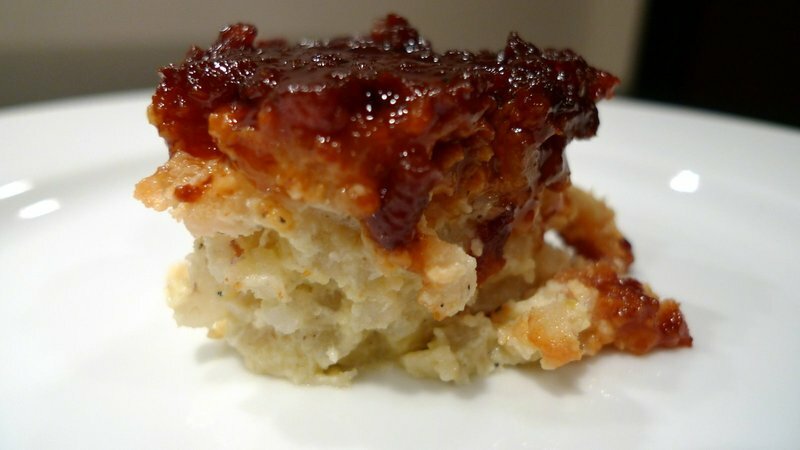 @Fatcat723 – Yes, the taste is the most important element and that’s where I need to improve my caramel technique. A little too bitter from scorching it. @Sinful_Sundae – @yang1815 – @mocawong – @windblown85 – @Finity – Glad you enjoyed the entry! @slmret – It’s just like with the macadamia nut cream pie I had to keep trying: Woe is me for having to keep making and trying something so tasty, right? My husband is a rice pudding fanatic! I make one from the Joy of Cooking book that is quite tasty. The addition of the carmel sounds and looks mouth-watering! I love flan and rice pudding. This looks yummy. 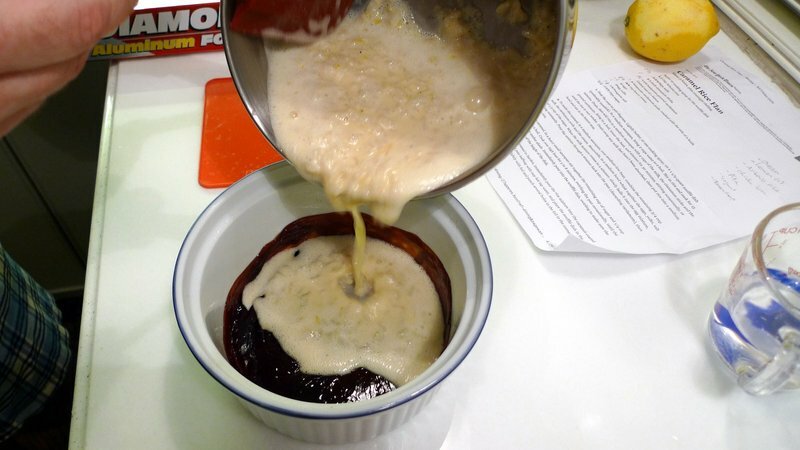 @murisopsis – I’d imagine that you could do something similar with rice pudding. 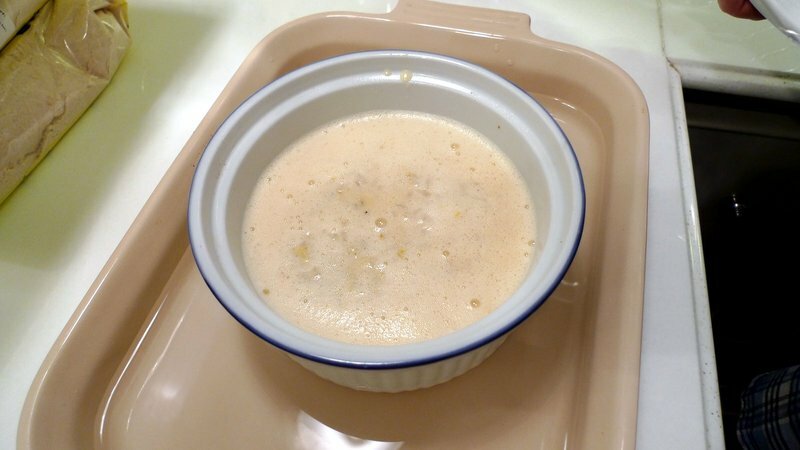 Make it a little thicker than normal, no eggs, then pour it into a caramel-lined dish, chill, then invert to serve. Wouldn’t stand up as firm, but would still sauce itself. @comet555 – @vsan79 – Glad you enjoyed it. I thought there was going to be more of you eating it. It looks very good and I love caramel.